Which version of Java should you use? If you’re not sure, you’re not alone. Since the cadence of Java version releases shifted from three or four years to six months as of the Java 9 release, lots of developers have been confused. Many of them have avoided Java 9 and Java 10 because they were short-term releases that lacked timely tool support. So, some developers stayed loyal to earlier versions while others decided to wait for Java 11, which is a long-term release Oracle will support for the next five years. Regardless of which version of Java developers choose, Rogue Wave’s JRebel saves time and money. JRebel is a JVM plugin that integrates with more than 100 leading frameworks as well as application services, IDEs and build environments. Developers can use it for any type of Java application. Application redeployments delay application changes. With JRebel, developers can make code changes and view the changes in real time while the application continues to run. JRebel also helps developers avoid the user experience gaffes that application redeployments cause. “For example, when a developer is coding some functionality that requires many steps of user interaction then redeploying the code might throw him back to the initial step, because this is how redeployments work, you lose whatever state you had. Here JRebel also comes into play and will reload the changes on whichever step the developer is on when writing that functionality, enabling him to continue from where he was,” said Michael Rasmussen, product manager of JRebel. JRebel preserves state, which avoids such disruptions. JRebel’s features have been expanded for SAP Hybris developers, based on demand. Those developers are trying to avoid the impacts application changes have on e-commerce and digital transformation processes. More developers are taking advantage of microservices and containers, although managing an increasing number of components can be a complicated and daunting task. Those building microservice architectures tend to develop multiple microservices simultaneously, some of which may be dependent on others. “With JRebel, you can develop a microservice and a client-microservice using it simultaneously without restarting either of them,” said Rasmussen. Like all Rogue Wave tools, JRebel helps enterprise developers build better code faster, whether they’re accelerating the move from monolithic architectures to microservices or improving the performance, scalability and security of production systems. 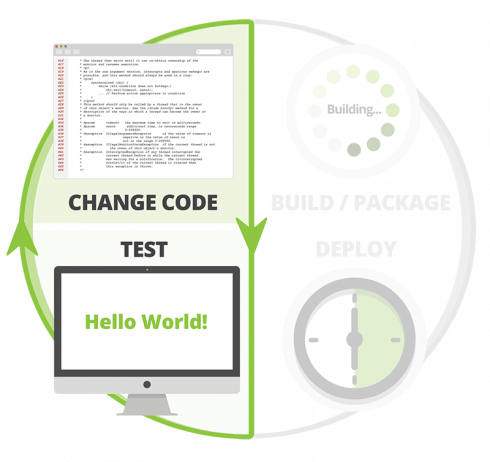 Without JRebel, Java developers can spend hours waiting as builds and redeploys connect across various development frameworks. JRebel collapses that time down to minutes or seconds, so developers can avoid context-shifting between tasks. In fact, 10 developers using JRebel can improve their efficiency by 20%, enabling them to complete the work of 12 developers.